Spoiler alert: when viewed large, this is a complete map and walkthrough of the wonderfully geeky ‘choose your own adventure‘ meets ‘Fighting Fantasy‘ style interactive book/game, Enemy of Chaos by Leila Johnston . You might have read her previous book, How to Worry Friends and Inconvenience People. More recently, Leila’s reading from Enemy of Chaos was one of the forty very interesting things that happened at Interesting 2009. If you were foolish enough to miss that, I hope you’ve at least read Cory Doctorow’s review of the book on Boing Boing. Earlier this week, Leila was kind enough to give me a copy. I loved it, and within a day I’d decided I absolutely needed to see what a map of every possible path through the book would look like. A six page loop between pages 201 and 23. A glitch which means page 227 can’t ever be reached except by flicking randomly to it; it’s a reverse dead-end. There are quite a few ways to reach the end, but a lot more ways not to. It’s very hard to win, and gets increasingly hard towards the end. Below is the same map, laid out horizontally. As Leila points out, it “looks like a big Romulan ship”, which is quite appropriate for what must be one of the geekiest books of the year. I love the way these open up more questions. A Jarhead is a marine, but what’s a saffie? 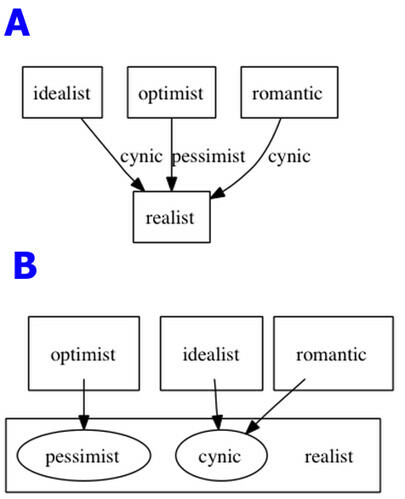 Of course the web also turns up some staggeringly stupid examples, including A pessimist is what a realist calls an optimist, if I recall the quote correctly. Wuh? Given my investigation into * is the new * last year, I naturally wondered how I’d go about graphing these. 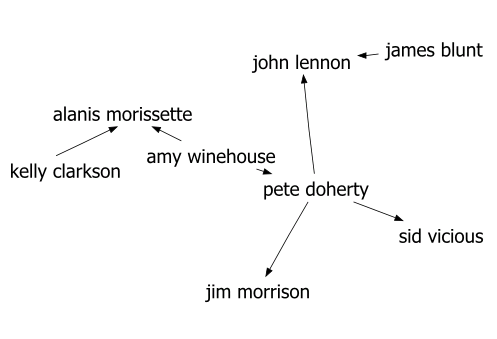 A quick experiment with Graphviz gives me a couple of alternative approaches. Even just wondering how to map these three-way relationships (in which all three parts might be re-used) gives some interesting choices. So far, I think B works better than A. You learn more from it. To tell me which two people call the realist a cynic using A, you’d have to read all the labeled edges. B is much easier. I’m sure I’m missing some obvious alternative approaches here though. Originally inspired by the LeisureArts chart from 2005, I decided to bring the idea up to date in September. Essentially, it’s a few pages of results from a Google search for “* is the new *” (and “* are the new *”). For this latest version I also added “+2007” to the search term, so it picks up things that happened (or were at least written about) in 2007. I then ran the results through some basic text processing. “x is the new y” became “x -> y”. 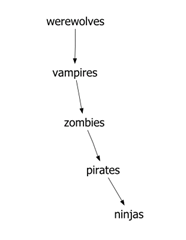 This happens to be the required syntax for Graphviz, which then automatically drew the directed graphs for me. The search was a bit of a manual process, and I ended up doing additional searches in order to flesh out the diagram (oh.. pirates are the new ninjas.. I wonder what are the new pirates… I’ll search for “* are the new pirates”). All of this is very similar to my first pass at this idea in September except this latest version, being 2007 specific, misses out more general links and includes culturally specific recent references such as the werewolves -> vampires -> zombies -> pirates -> ninjas chain (which I’m really happy about) as well as the iPhone and a few other recent highlights of this year. Drake Bennett at the Boston Globe wrote a thoughtful piece about it. If you want to know what happened in 2007, you could do worse than noting what it was that people decided was the new black, or the new oil, or the new golf. Because it is so ubiquitous and so adaptable, because it so easily captures the human mind’s penchant for analogies, and because it is constantly rendering itself obsolete (what is the new iPhone? who is the new Amy Winehouse? ), this off-the-shelf rhetorical device makes an ideal marker of a year’s conversational currents. The charts here are an unsystematic attempt, culled from Web searches, to trace the patterns that emerge. Eventually, sapped by this sort of subversion, the phrase might have to give way to another equally handy one. What the new “new black” would be remains anyone’s guess. If you don’t happen to get the dead-tree version, you can read the article on the Boston Globe site. ffffound.com (closed beta. Sorry, no invites left) is really very lovely. This: del.icio.us crossed with Clipmarks crossed with Flickr. 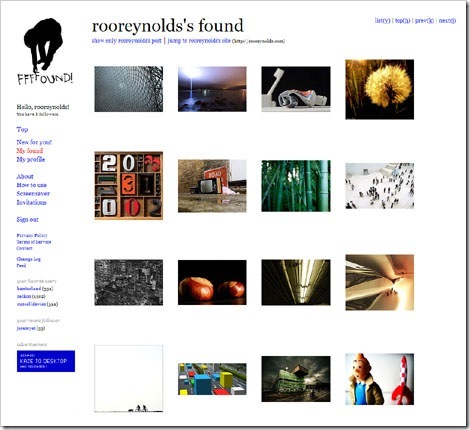 It’s social bookmarking for images. It’s also a lot simpler than del.icio.us. As nice as that simplicity is, there’s a big part of me that really wants it to support tagging. I’ll try to share inspirational typographic/arty/design stuff there. 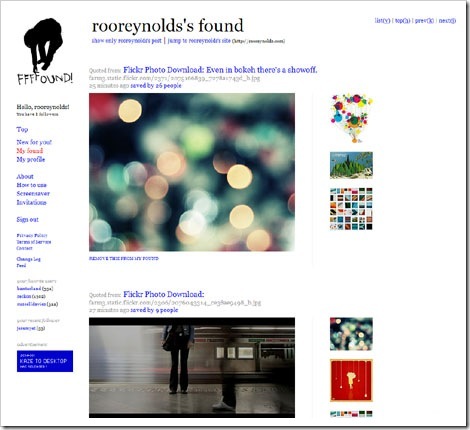 I’ve added the feed and a link to my page to the feeds list in the sidebar. 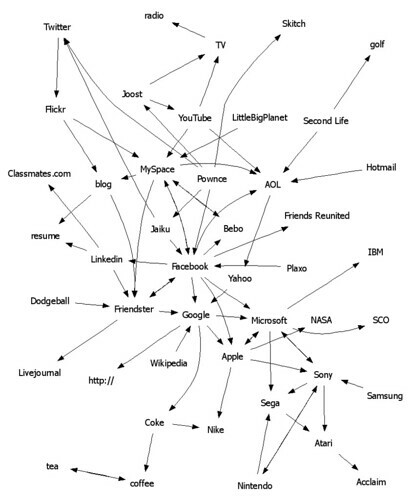 Inspired by this lovely visualization (which I discovered recently via the always-interesting Information Aesthetics blog) of what was the new what in 2005, I decided to bring it up to date. 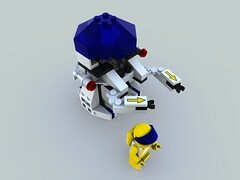 Here’s what I ended up with after a couple of hours of hacking. 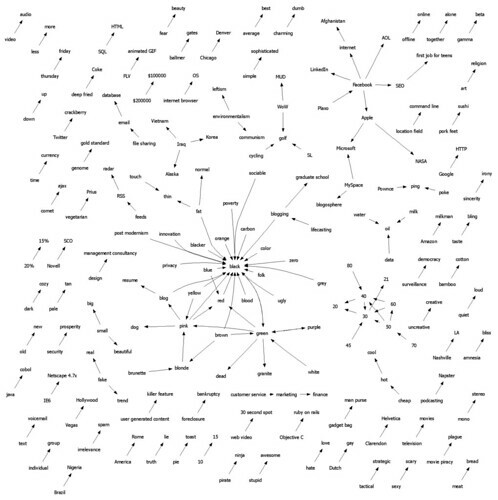 Around 160 relationships in the form x is the new y. 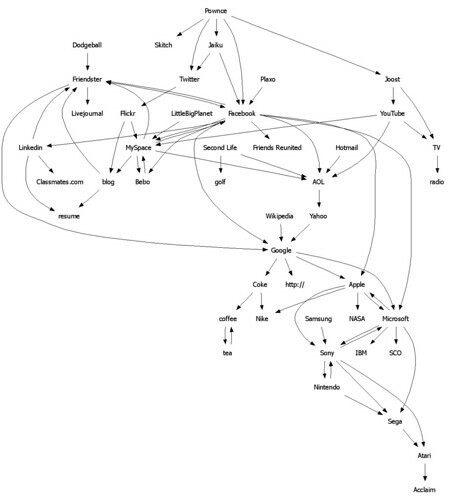 The layout was entirely automatic, thanks to Graphviz. I actually had quite a bit of manual intervention at this stage (more than I realised would be necessary), removing such results as “The Oxford English Literary History is the new century’s definitive account of …” and a few others that didn’t interest me. 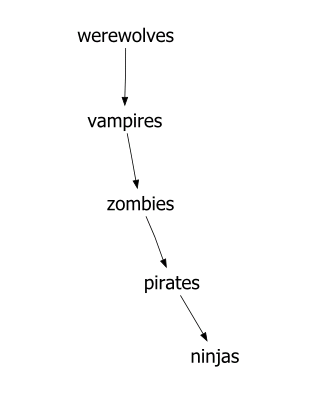 Already, I could use the `dot` and `neato` Graphviz tools, and entertained myself by checking and tidying the results still further. And there we have it. I’d really like to make something which allows me (and you) to delve into chosen terms interactively. Seeing the interesting cluster around Facebook, even in such a small set of relationships, made me want to see what else was lurking around “* is the new Facebook”, and “Facebook is the new *”. 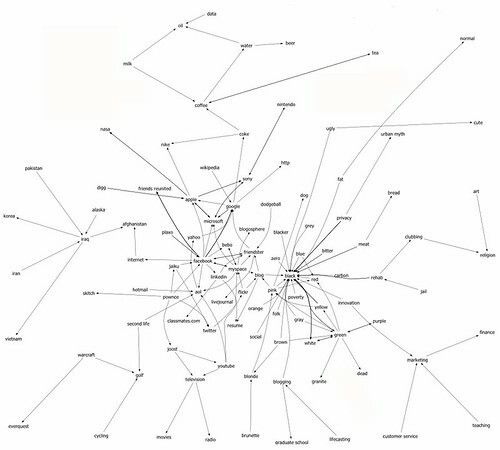 In fact, I thought the same thing about pretty much every node in the graph. So, something else for the todo list then. Update: I explored trails starting from Facebook (manually searching, for now) and came up with another set of data. Here are two graphs generated from that data, rendered using dot and neato respectively. I think I prefer the (less formal looking) neato example, though there are some nice features of the vertical flow in the dot graph too. Update: this idea later got an update for the end of 2007, and was even printed in the Boston Globe. Inkscape is a free SVG editor for Linux and Windows (an article about it was linked from Slashdot today) which spun off from Sodipodi. 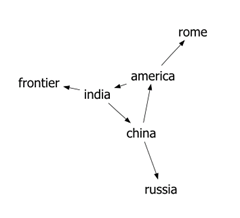 Dia is another related project; designed to be more of a diagramming tool (a bit like Visio). Dia (like Sodipodi) requires GTK. ArtRage is more of a realistic painting simulator than an art package. It’s very intuitive and works splendidly with a graphics tablet. It’s free. Sadly it only works on Windows, but since that they were developing primarily with the TabletPC in mind I can just about forgive them that.